Dictaphone was an American company, that produced sound recording devices most commonly used to record speech for later playback, or to be typed into print. The name "Dictaphone" is a trademark, but in some places it has also become a common way to refer to all such devices. 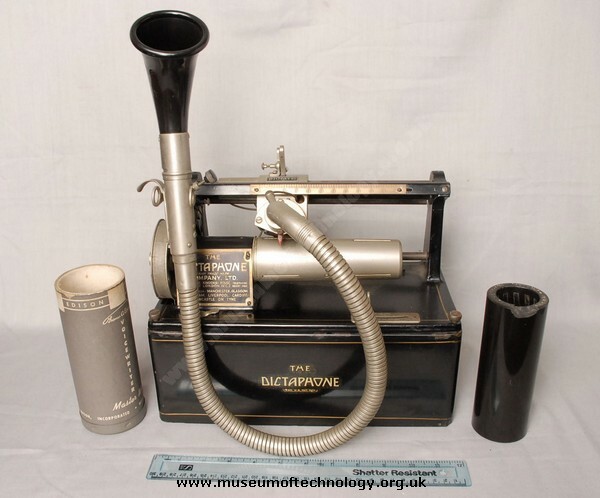 The name "Dictaphone" was trademarked by the Columbia Graphophone Company in 1907, they soon became the leading manufacturer of such devices. After relying on wax cylinder recording through to the end of World War II, in 1947 Dictaphone introduced their Dictabelt technology, which cut a mechanical groove into a plastic belt instead of into a wax cylinder. This was later replaced by magnetic tape recording and eventually hard-drive recording.